Club Penguin Cheats by Mimo777 Club Penguin Cheats by Mimo777: Club Penguin Medieval Igloos Coming! 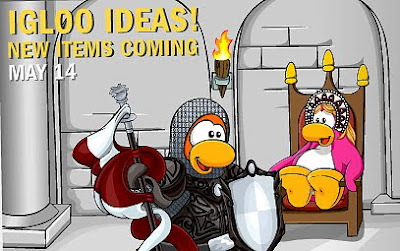 Well, the Club Penguin Medieval Party will be coming to an end soon, but not before we get new igloos! Woo hoo! And, we will be able to continue the Medieval Party long after it is gone with the NEW Grey Ice Castle igloo. There are also thrones and arched windows to help keep the Medieval Party going. There are 5 things in the newspaper that Club Penguin wants to make sure we do before the party ends. I am pretty sure there isn't anything you have missed, but you can check them out in the new Club Penguin Times! Be sure to check back later with all the updates!